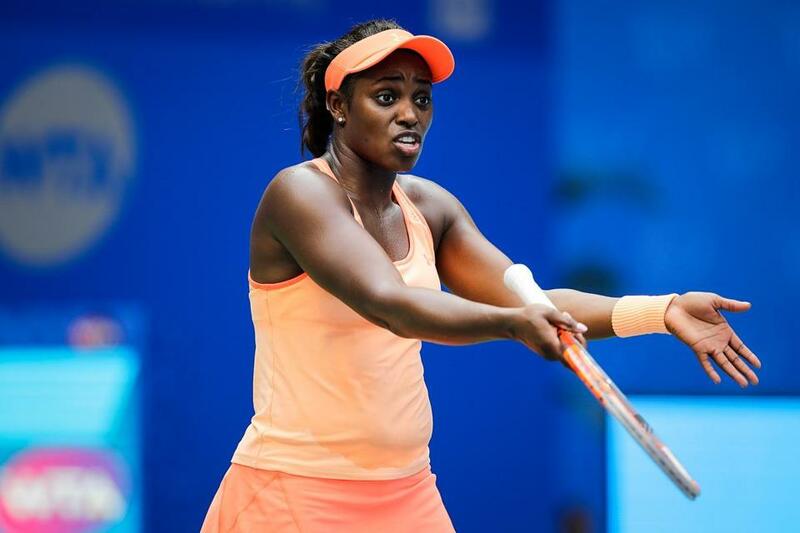 US Open champion Sloane Stephens had a frustrating day in the first round of the Wuhon Open, losing to Wang Qiang. US Open women’s tennis champion Sloane Stephens and runner-up Madison Keys were knocked out of the Wuhan (China) Open in the opening round. In their first matches since the final at Flushing Meadows, the 17th-ranked Stephens lost to Wang Qiang of China, 6-2, 6-2, while the 12th-ranked Keys was beaten by fellow American Varvara Lepchenko, 6-2, 7-6 (7-4). The last time Grand Slam finalists lost their next match was after 2005 Wimbledon, where Venus Williams beat Lindsay Davenport. Also, defending champion Petra Kvitova lost for the first time in Wuhan on her third visit. Kvitova won in 2014 and last year, when she dropped just one set. It took Peng Shuai 3½ hours to knock her out, 7-6 (9-7) 6-7 (7-5) 7-6 (7-3) Stephens’s serve was broken early in both sets. Wang closed out the victory on her sixth match point. Keys, seeded 10th, broke Lepchenko early in the second set, but the qualifier rebounded. Lepchenko was broken while serving for the match at 6-5 but rushed to 5-1 in the tiebreaker. Kvitova had won all seven previous contests against Peng, but China’s best player began by taking her first set off the Czech in four years. Kvitova evened the set score, and they kept breaking each other’s serve in the decider until Peng held for 4-3. Peng served for the match at 5-3 but Kvitova rallied and saved a match point at 6-5 down. Peng finally won in the tiebreaker on her fourth match point. They weren’t the only upsets. Seeds No. 5 Johanna Konta and No. 12 Angelique Kerber, and former US Open champion Sam Stosur were also sent packing. Star receiver Antonio Callaway and running back Jordan Scarlett are among nine Florida players facing felony fraud charges. According to Alachua County (Fla.) court records, sworn complaints were filed against the suspended players. The State Attorney’s Office will investigate the complaints and decide whether to formally charge the players with third-degree felony charges. Asked about the potential charges affecting the players’ status with the team, coach Jim McElwain said: ‘‘You’re darn right.’’ The other players are defensive lineman Keivonnis Davis, defensive lineman Richerd Desir-Jones, linebacker James Houston, linebacker Ventrell Miller, defensive lineman Jordan Smith, offensive lineman Kadeem Telfort, and receiver Rick Wells. All of the players are facing at least two felony charges. Smith is facing five, and Telfort is facing 30 . . . Arkansas standout receiver Jared Cornelius will undergo left Achilles’ surgery and miss the rest of the season. Cornelius was hurt early in the second half of the overtime loss to Texas A&M on Saturday. Arkansas coach Bret Bielema says a redshirt year is possible for the senior — as well as potentially entering the NFL draft. Defending NCAA national champion Denver received 48 of 50 first-place votes for the No. 1 ranking in the USCHO Division 1 men’s poll. Boston University is ranked second, followed by Minnesota, Harvard, and UMass-Lowell. Other New England schools in the top 20: Providence (No. 11), Boston College (13), Quinnipiac (14), and Northeastern (20). Minnesota Lynx coach Cheryl Reeve blasted her team one day after losing the opening game of the WNBA finals, wondering aloud if it is taking for granted a sixth trip to the finals in the last seven years and saying anyone who suggested her team should derive encouragement from its comeback resides in ‘‘Loserville.’’ ‘‘It’s mind-boggling for a team that’s been here however many times,’’ Reeve said. ‘‘Maybe it’s old hat for them. Maybe this is something they’re just softened to.’’ The defending league champion Los Angeles Sparks won Sunday’s game, 85-84, after taking a 28-2 first-quarter lead. Game 2 is Tuesday night in Los Angeles. The Yankees’ Todd Frazier said the condition of the young girl injured by his foul ball last week has improved and she could be leaving a hospital soon. The girl was hurt by a 105 m.p.h. drive off his bat into Yankee Stadium’s lower deck behind third base last Wednesday and was taken to a hospital for treatment. Frazier has been in contact with her father and plans to meet with the family . . . Wally Uihlein, one of the most influential executives in the golf equipment industry, is retiring at the end of the year after 41 years at the parent company of Titleist. Acushnet says Uihlein will be succeeded as president and CEO by David Maher, the current CEO. . . A referee in a youth football game has been charged with aggravated assault after witnesses say he pulled out a pocket knife during an argument with a coach. Police say Arnold Jay Davis was arrested Saturday after working a game in Knoxville, Tenn. An argument occurred shortly after Davis had declared the game a forfeit.